A summer administrative assistant intern at Kraus-Anderson’s Minneapolis office, Madeline Gerhardt is a student at the Berklee School of Music. On Thursday June 24, 2016, five volunteers from Kraus Anderson visited Open Arms facility for four hours at their location in Minneapolis. Four out of the five were returning volunteers who came back because they enjoyed it so much before. They all agreed that packing one meal after the other was relaxing, and found that they could tune out the rest of the world and just focus on one scoop of rice at a time. They relished in the change to their hustle and bustle of the office world that they’re used to. Everything was carefully thought and planned out, all that was needed was man power-or should I say women power! 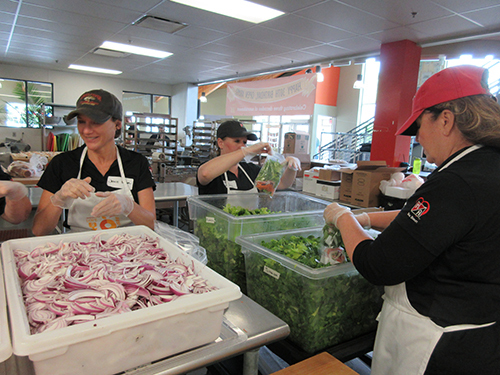 Together, they packed 99 chicken lasagna entrees, 143 parsnip curry entrees, and 200 green salads. In all that’s 442 meals! Open Arms assists people affected by life-threatening illnesses by cooking and delivering free, healthy meals to them. They help people who are living with illnesses such as cancer, HIV/AIDS, multiple sclerosis, and ALS; and as well to those who care for those affected. Clients receive a week’s worth of meals at a time, including all three meals of the day and snacks. “We believe that eating delicious, nutritious meals helps make our clients’ medicines and treatments more effective, so they are able to lead healthier, more independent lives,” states the Open Arms website. Almost all their food is prepared in-house and recently they have started to grow some of their own vegetables. As of June 2016, 1,000 clients rely on deliveries from Open Arms. They cater to many different tastes as well. They offer vegan and vegetarian meals as well as homemade baked goods and pastries. Open Arms works with chefs and nutrition specialists to create the most delicious and nutritious food possible. Every meal is labeled with all the ingredients that were used, even the cookies. While there is much preparation gone into the food, there is equal attention paid to the cleanliness of the volunteers. Open Arms ensures that all the volunteers are aware of how important it is to keep one’s hands and arms as clean as possible. They remind volunteers that even an involuntary itch on your nose could be a possible harm to a client. Before going into the kitchen, volunteers must scrub their hands and up their arms with warm water and soap, put on a very fabulous hairnet, and finish with a pump of hand sanitizer. The leaders there at Open Arms also encourage that volunteers change gloves every meal. Volunteers clearly go through extra care to avoid the spreading of germs. Even though it is extensive, it truly puts into perspective just how precious these meals are and the lives that they strengthen. “I have worked at Open Arms twice now, and I really am impressed by the way everything is so well organized, and all of the thought that goes into making/creating the meals,” said Dian Parnell, an administrative assistant at Kraus-Anderson Realty Company. exact, et on peut mÃªme retrouver la signature de Bois Noir dans Bois des ÃŽles, qui est lui fÃ©minin ! Jacques Polge s’Ã©tait inspirÃ© de ce parfum d’Ernest Beaux pour son Bois Noir, qui, faute de succÃ¨s, s’est rÃ©incarnÃ© en Egoiste…J’attends la suite des « masculins fÃ©minisables » avec impatience !